One brother recently shared a revelation he had concerning the above Scripture passage in Daniel 3:5. He believes that worship in the modern institutional church has become like that of King Nebuchadnezzar's command that, when the music begins to play, everyone must fall down in worship of the idol. Is that what we've done in our churches today? When the music begins, is our worship so controlled by the "Worship Leaders" that we must then and there fall down and begin worshiping? If we choose not to, are we then cast off by the institutional leaders into a spiritual blazing furnace, as it were, for not "playing" by the rules set out in the "order of service" by those in leadership? Can one person or group of people really lead a congregation of people in corporate worship? I know this perhaps sounds a little radical, but can there really be such a thing as a “Worship Leader” or a “Worship team?” What I mean is that, if “God is Spirit, and his worshipers must worship in spirit and in truth” (John 4:24), then can there really be an individual or group of people who lead others in this worship experience? Where does the Bible give examples of “Worship Leaders” or “Worship Teams” in the New Testament church? While I’ve been looking for such an example, I have yet to find it. Certainly when we read the Bible we see that there are times when the people are united in their singing and worship. I get the impression, however, that in such times of “corporate worship,” the singing just breaks out; first by one person, and then later by someone else, and in both cases, with everyone else just joining in. I suppose it could be argued that the person through whom the singing breaks out is the “Worship Leader.” However, I cannot help but think that the “Worship Leader” is a man-made institution, and if so, then I would argue that it’s important to re-think why we continue in it. The problem with any sort of “Leader” in the church is that we have created a two-tier form of Christianity. An “us” and “them” mentality is indirectly implied. This is especially evident when we use platforms, or stages, in order to separate the two “classes” of Christians. We have those who “lead” and we have those who “follow.” We have the “upper crust” Christians “up” on the stage and the “lower crust” Christians “down” on the floor. The implication is that some of us are better than the rest of us. Having a “Worship Leader” also supposes that it is possible for everyone to be in the same state of worship at the same time. But is that really possible? 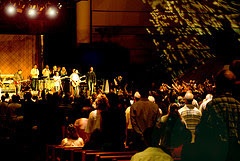 Can every person in the gathering be in the same state of worship at the same time? Can we all really have a “mountain-top” experience with God at the same time? The worship leader tells us to “please stand” and to “please be seated” and to do this and to do that as if to say that, by doing so, you and I might better come to God. Are all these things not simply religious acts? If I’m worshiping “in spirit” (John 4:24) how is it possible that anyone else lead me in what’s happening in my spirit? Is God pleased with our worship? What would He say about it? Are we right on track, or is there maybe some room for improvement? If there is room for improvement, then in what areas can we improve? The “truth” about worship can be summed up in James 1:27 which says, “Religion that God our Father accepts as pure and faultless is this: to look after orphans and widows in their distress and to keep oneself from being polluted by the world.” Two things can be observed here. First, our worship and faith as a whole, is proved not so much by what we say or sing, but by how we take care of others. We can say we love God all we want through our worship songs, but if our actions towards other people don’t speak louder than those songs, we’re liars (1 John 4:20). Secondly, we need to stop letting the world pollute us individually, and the church as a whole. Most of us would agree that worldly and carnal methodologies have no place in the church, and yet, many such things have long since already crept into the church to the point where we now think of them as normal and Christian. In 1 John 2: 15 we are warned, “Do not love the world or anything in the world. If anyone loves the world, the love of the Father is not in him.” Like wise Paul says, “ offer your bodies as living sacrifices, wholly and pleasing to God – this is your spiritual act of worship. Do not conform any longer to the pattern of this world, but be transformed by the renewing of your mind” (Romans 12: 1-2). One day the Lord Jesus will come and take the church out of the world. Don’t you think that in expectation of that day, we start by taking the world out of the church? True worship is primarily relational. It’s all about love and relationships. It’s all about loving God and loving each other (Matthew 22: 36-40). At the same time, worship is also about singing, both individually and corporately. Some of the most meaningful and beautiful singing I’ve ever experienced has always been very spontaneous and un-planned. There is no “order of service” to distract, it just happens out of the love for God in our hearts. There’s no need to plan it because it will happen all on it’s own out of a right relationship with our Lord. In an institutional church setting, this is difficult. There is very little freedom, and for those who try and exercise their freedom, there is often only oppression. One of the wonderful things I’ve discovered since leaving the institutional church system is the freedom and spontaneity of worship. There are no “Worship Leaders” and no “Worship Teams.” There are simply brothers and sisters in Christ, who together in love and relationship, worship God through sharing their lives in the Word, in Song, and most of all, in Action. There is no one greater and no one lesser, for all are on the same level. Worldly and carnal ways of “doing” church have been cast away, and if some carnal way is still discovered, it is prayerfully addressed and promptly dealt with. Truly, “they are the kind of worshipers the Father seeks” (John 4:23). Timothy has clear instructions for the leadership in the church. Right through the old testament leaders are appointed to guide the people. I think I understand where you're coming from, friend, but personally I do not see the connect between Timothy's instructions for leadership in the church and our modern worship leader/team in the institutional systems of today. Thanks for the comment. Peace. Whose Gospel Are We Following? Has Hollywood Invaded the Church Service?